What does the dendrogram show, or what is correlation analysis? 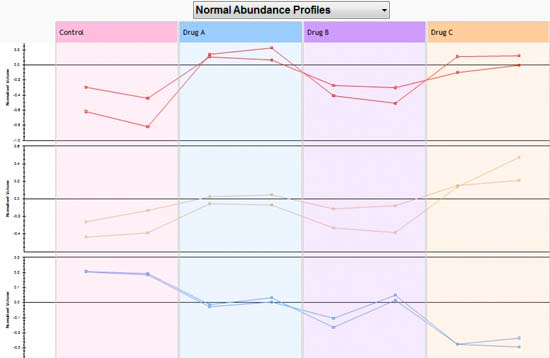 The correlation analysis is performed on arcsinh-normalised compound abundance levels. Compounds can then be clustered according to how closely correlated they are. Compounds with a high correlation value (i.e. close to 1) show similar abundance profiles while compounds which a high negative correlation value (i.e. close to -1) show opposing abundance profiles. 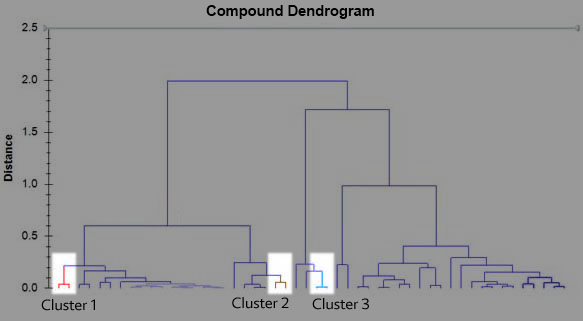 Draw a dendrogram showing clusters of compounds according to how strongly correlated the compounds are. This correlation can be seen in the abundance profiles of compounds from the same cluster. where D = Distance and C = correlation between compound clusters. If compounds are highly correlated, they will have a correlation value close to 1 and so D=1-C will have a value close to zero. Therefore, highly correlated clusters are nearer the bottom of the dendrogram. Compound clusters that are not correlated have a correlation value of zero and a corresponding distance value of 1. Compounds that are negatively correlated, i.e. showing opposite abundance behaviour, will have a correlation value of -1 and D = 1 - -1 = 2. As we move up the dendrogram, the compound clusters get bigger and the distance between compound clusters increases in value. It becomes difficult to interpret distance between compound clusters when compound clusters increase in size. 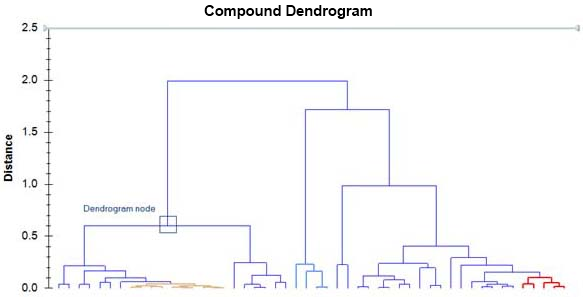 A possible way to think about the abundance profile behaviour of two compounds would be to see how far up the dendrogram you need to go so you can move between the two compounds. In the dendrogram below, you see that to get from the compound on the left to the compound in the middle, you need to move up a distance of 0.6 (just follow the branches). Now, compare the following compound clusters. Cluster 1 (left side and in red), cluster 2 (middle left and in brown) and cluster 3 (middle right and in blue). This illustrates the degree to which you can comment on the distance between compound clusters. The abundance profiles for compounds in those clusters are show below. Finally, looking at all the abundance profiles on the main right hand branch, we see that while abundance profiles are generally quite similar, there is certainly a variety in individual abundance behaviour. In other words, as clusters increase in size, their abundance profiles become more general.